A man very much enjoying the America’s Cup shift to catamarans is Oracle Racing’s structural engineering guru Dirk Kramers, a multihull fan who over past decades has been particularly involved in the A-Class. 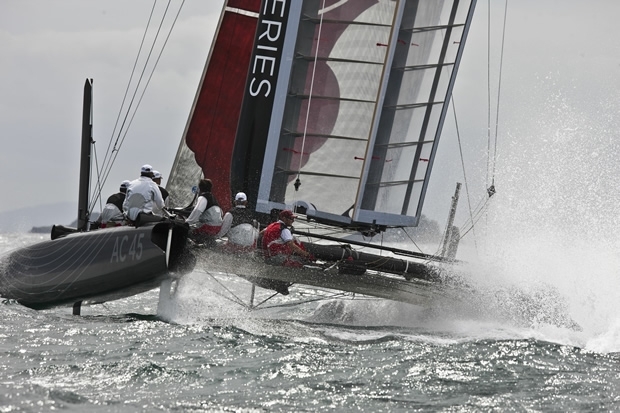 With Cup involvement dating back to the 12m era and having worked for Alinghi for the past three AC, including the Alinghi 5 maxi-catamaran, Kramers was snatched up by Oracle on the demise of the Swiss team, along with Murray Jones, CAD expert Aaron Perry, mast designer/engineer Kirst Feddersen and bowman Piet van Nieuwenhuyzen. Since joining the team Kramers has been working out of an office close to home in Newport, with other Rhode Island-based Oracle design team members, Perry and mast specialists Scott Ferguson and Andrew Gaynor. He expects sometime later this year to decamp to San Francisco, when Oracle Racing set up their new team base at the AC34 venue. While Kramers’ speciality is engineering, his long term interest in multihulls as both a sailor and a designer allow him to hold a comprehensive perspective on the latest boat developments in Cup land, and the most recent addition, the AC45. Where there is noticeable difference is in the bow profile. The Extreme 40 for example has plumb bows where the latest trend Kramers describes is for reverse ‘Dreadnought’ wavepiercing-style bows which you are seeing now from everything from Banque Populaire to USA 17 down to A-cats and F18s. The new classes of AC45 and AC72 have frequently been describes Alinghi 5 with USA 17’s wingsail. Kramers confirms what builder Tim Smyth told us, that initially in developing the 45 they had considered simply putting a wingsail on an Extreme 40 platform in order to make the project happen in the tiny available time frame, but this quickly evolved into them coming up with an entirely new design. However the basic dimensions, particularly the beam:length ratio governing righting moment are similar to the Extreme 40. This spine arrangement Kramers says was used partly for its simplicity allowing the AC45 to be disassembled and containerised for shipping rapidly - one key criteria of the AC45’s design. Otherwise from a engineering point of view, Kramers says that on the one hand the AC45 was less at the limit than they might normally push to for a race boat as it is a one design, but equally it had to be put into production without getting “too ridiculously expensive”. As a result there are some compromises: the hulls aren’t toed out, the daggerboards are conventional straight up and down affairs, rather than being curved and canting, and the beams are easily manufactured tubes rather than an aerodynamically sleeker alternative. The beam to hull connections are also what is used on most beachcats and the Extreme 40 – bolts and a keyway, again for quick assembly. This is certain to be an area where there will differing solutions come the bigger and more highly loaded AC72. For Kramers personally the AC45 represented the first solid wingsail he has worked on since Stars & Stripes in 1988, although Scott Ferguson and Andrew Gaynor in the Oracle Racing Newport branch both worked on USA17’s. Obviously experience gained in creating the team’s towering wing for their 33rd AC winning trimaran was invaluable. “The underlying tools were there. The challenge was to come up with a wing design in short order. It is still pretty much a grand piano though,” says Kramers. Again there was some simplification of the wing compared to USA17 aside from sheer scale. “The big wing for USA17 was a box tube with a nose and a tail for the main element. This one is more like the wing on Star & Stripes, where the spar is a D-section at the front, with a tail.” Like USA17’s wing, it is simpler than a C-Class catamaran wing – it has two ‘elements’ (the vertical sections) and a single slot whereas recent C-Class wings are three element and have a twisting leading edge on the front element – all devices giving them a higher lift co-efficient. Twist up the wing is developed via the rear flap which is divided into three sections. Being able to use headsails on the AC45, significantly changes the load case in the wing making it more similar to that of a conventional mast in that it must be possible to crank up forestay tension. “And on top of that you have the peculiarity of loads coming from the wing,” says Kramer. “In fact the runners were probably the biggest challenge, because you have lost your mainsheet load. The loads on the controls are really low - the mainsheet is just 1:1 through to a tiny winch. On a normal cat, a lot of the forestay load comes from the mainsheet, but now you have lost the mainsheet it is all on the runners.” In fact the runners see the highest loads on board the AC45. Because the AC45 is a one design, so, in theory, the safety factor could be upped in the wing to make it more robust. “For us it has been a nice project in the sense that we aren’t pushed to the edge to find the edge,” confirms Kramers. “It is primarily just meant to behave well. If it was for a full-on racing boat I’m sure we’d figure out how to do it lighter. It is a balance between simplicity, weight, performance, cost, etc.” The main priority with the AC45 wing was to simplify its construction to enable production building and exact replication, while trying to keep the weight as low as possible. Kramers points out that even in the A-Class, where the una-rigs typically have a long top mast, the spar isn’t expected to survive a capsize. The AC45 doesn’t have a top mast, “so hopefully you don’t have a big bending moment when the masthead hits the water,” says Kramers. One difference between the USA 17 and AC45 wings is their controls – after some machinations in the New York Supreme Court, hydraulics were allowed on USA17, whereas on the new cat it is all manual carried out on block and tack. Otherwise the controls for the wing remain the same – there is a traveller/sheet adjusting the overall rotation of the wing to the wind, then there are camber and twist controls to alter the shape of the wing. And that is it, with the exception of the headsails. “It will be interesting to see how the sailing techniques are going to evolve in the class. In theory you have one guy on the camber, one on the twist, another on the jib, another on the traveller and one steering.” The AC45s are to be sailed by five, but like the Extreme 40s, they will carry one guest. There are no hydraulics on the AC45 and at present there are no instruments either. The only speed information they have is coming from a GPS. However Kramers has managed to slip a load cell on board, fitted where the fore and aft spine joins the aft beam. The electronics for this are stored in an orange box and include an alarm. “That goes off if you wind on the runner too much,” says Kramers. At present Kramers says the top speed has been just under 30 knots, so it seems likely that speed in the early 30s will be seen at some point. We look forward to seeing them racing, or even hearing when and where we might get the opportunity to see them race (an announcement was supposed to have been made at the end of January).